Quite recently I video blogged about time blocking and how to do it the right way. I have also blogged about this topic on Bob and Rosemary’s blog earlier this fall (that was from online business perspective). The main message on my video was that not only should you block your time, but you should block your location too. This post continues the time blocking theme and extends it a little bit. In fact, I want to bring up couple of extra points to time blocking and how to make it a more effective productivity tool for you. First, let’s define what time blocking means. In essence, it’s all about reserving a segment in your calendar for a certain task (like in the image below). This means that you can focus on that particular task only and improve your productivity that way. When you define a task to the future, you can expect it come and you are mentally prepared for it. Especially if the task you are doing is a complex one, you can be mentally prepared for it in advance. In some cases you might already come up with some ideas that make completing the task in an easier and faster way than what you originally had thought. Time blocking also means focusing on one task at a time. I bet you have already seen a difference when you focus on one thing at a time or when trying to do multiple things at a time. The former way of working produces better results and you actually complete a task much faster. Related to the previous point, when you get your stuff done in a focused manner, you improve your productivity. The more you get done the better you feel about yourself. Finally, once you realize that you got your task done, you are less overwhelmed and stressed – even in a stressful situation with tight deadlines. Time blocking is a simple process. 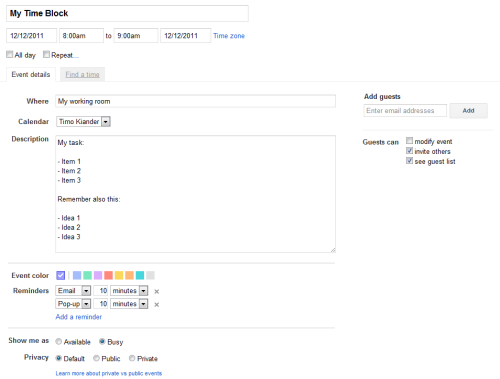 The steps may vary depending on the application, but for demonstration purposes, I’m using here Google Calendar. How to make time blocking even more effective? Time blocking itself is an effective way of planning and getting your work done. However, there are certain ways to make it even more effective. a) Where you do it: Time blocking itself is useless, if you have to work in a distracted environment. The location is crucial if you want to get your work done. In an office environment this could be a meeting room. At home, you could be working in a separate room or if you have a separate place where you are the most productive (park, coffee shop, library …) then choose that place as your location. b) When you do it: Timing matters too. For example, if I want to focus on fully to what I’m doing in my day job, I choose to do it at home – either on Mondays or Fridays. 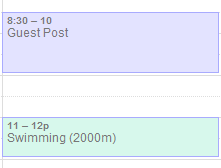 I have negotiated a remote-working agreement with my boss, so I try to schedule my time blocks to those weekdays. You might have your personal preference (day of the week) when you can focus the best. Choose that day for your time block. c) Make it detailed enough: Include as much information as possible to your calendar reservation. This helps you to get up to speed faster and you are not wasting you valuable time block period for searching documents and wondering what you were supposed to do. d) Let other people access your calendar: This is very important, especially in the office environment. When others see that you have blocked some time in your calendar, they are less likely to distract you when you work. e) Use a timer: To make the time period even more effective, use a timer when you work. This way you can focus 100% on the task you are doing. f) Block your time right now (and defeat Parkinson’s Law): Try to reserve a time block for your task as soon as possible, most likely when the task is assigned to you. This way you can defeat Parkinson’s Law. Parkinson’s Law is defined as follows: Work expands to fill the time available for its completion. What it means that for instance if you have a two hour task and the deadline is one week from now, you will probably use that whole week for that task anyway. Either you keep doing it bit by bit or you start doing it the last minute. Also, as long as the task is not done, it is on your mind too. To avoid this, reserve the time block as quickly as possible and get the task done right away (if it is possible)! 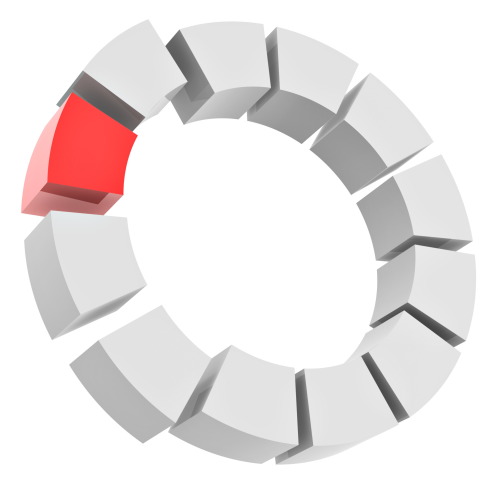 g) Use Pareto principle for defining the right tasks for time blocks: Pareto principle is also known as the 80/20 rule. One classic example of it is that 20% of your clients bring you 80% of sales. 20% tasks are the most important ones you have to accomplish, so try to define time blocks at least for those tasks. That way you can make sure that they get completed and you are able to reach your goals faster. h) Take effective breaks: It is also important to use small breaks between the working sessions. For example, you might have a task that you have allocated 3 hours. Instead of working 3 hours straight, try to split the time block into smaller pieces by taking effective breaks. Whether it is Pomodoro technique you are using, the working sessions are 25 minute units with small breaks between. If you have your own personal preference of working, use that instead. Time blocking is a very effective technique to get work done. To make it even more effective, use these techniques described on this blog post. Finally, I would like to redirect you to another blog, maintained by Kevin Achtzener . He has written a free downloadable e-book called Time Blocking 101. Although you need to opt-in to get the e-book, it is worth doing. Kevin shows many additional tips for making time blocking even more effective. 1. Put this blog post into action! If you are not using time blocks when working, start using them now! Are you using time blocking technique? Do you have any tips for making time blocking even more effective? I would appreciate it if you share this post on Twitter or on Facebook.